Most food favourites benefit from the steam treatment – it’s a healthier way to cook without adding oils or fat. Meat and fish keeps its flavour and succulence because the steaming process infuses the food, sealing in its natural juiciness and nutritional values. 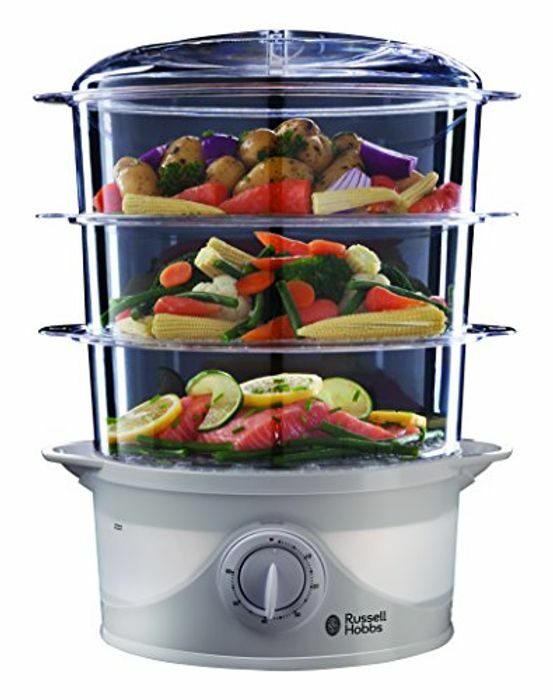 The Russell Hobbs 3 Tier Food Steamer has stacked baskets with a total capacity of 9 litres so you can steam different foods simultaneously without having to juggle pots and pans on your cooker hob. It saves on washing up too! The turbo steam ring design creates a plume of steam in less than 40 seconds and, because steaming is faster and uses less energy than a conventional oven, you can whip up a meal faster without running up your fuel bill. If you haven’t tried steaming, why not give it a go and look forward to a rainbow selection of fresh healthy foods that are full of flavour and natural goodness. No deal here..... sellers trying to rip people off and mislead them by inflating the price to make it look like a deal. Just look on the price history checker and you will see it has never been £49.99...... the highest it has been was £42 in 2013. I hate to see people mislead and ripped off like this.